I sincerely thank the AKG Centre for inviting me to share some thoughts at this inaugural session of the 4th International Congress on Kerala Studies. Way back in 1994, under the inspiring initiative of EMS Namboodiripad, this process of periodic conferences began. The declared objective was to undertake a stock taking in order to re-orient the developmental processes and policies in the state, in response to changes in the global and domestic Indian conditions. As the Chief Minister of the first democratically-elected Communist government under a bourgeois system anywhere in the world way back in 1957, EMS Namboodiripad had realized, by the early 1990s, that such a re-orientation of the developmental trajectory in the state was in order. The path breaking reforms undertaken by the 1957 government like land reforms, universalisation of school education and primary health care etc had laid the foundations of the people’s centric egalitarian oriented social development process whose impact today can be seen in the Human Development indicators of Kerala, matching, in fact, surpassing (on some parameters) the levels which we see in the countries of the developed capitalist world. However laudable the results of such a trajectory may have been (popularly called the `Kerala Model’), EMS felt, as he said in the inaugural address of the 1st Conference in 1994: “I feel that we need to take fresh stock of our present situation and draw up a new agenda”. Clearly, EMS felt that a course correction is needed for a sustainable development by “strengthening the material production base”. 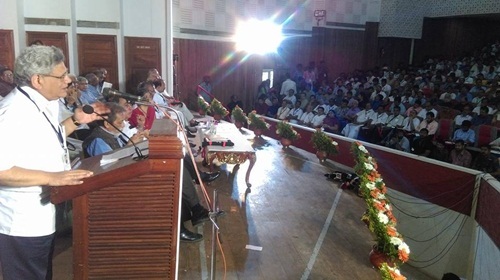 The deliberations of that conference had a telling impact on the policies pursued by the 1996-2001 government led by the Left and Democratic Front (LDF). The highlight of this was the implementation of the People’s Plan Campaign (PPC) that involved an agenda changing programme of devolution of economic schemes to local bodies. Naturally, this was based on the already advanced levels of democratic decentralization that was achieved by Kerala in the earlier decades. This resulted in creating a trajectory of developmental policies with people’s involvement and based on a social environment conducive for overall development. Unfortunately, the UDF government that had then followed (2001-2006) and the present UDF government have been working overtime to undo the gains of this process. This 4th Congress, carrying forward such an understanding, begins with this symposium on “The Left alternative for India” within the overall framework of Kerala Studies. In the overall context of this theme, it is necessary to underline that Kerala’s success story has an important bearing on the Left alternative in India. Hence, the focus is on Kerala within the construct of the theme of this Congress. Permit me to anticipate at least two conclusions of my reasoning that follows: a) From the viewpoint of economic development, there is an urgent necessity to arrest the stagnation that has set in during the course of the last five years under the present UDF government and to redirect the policy trajectory towards an accelerated developmental strategy. This necessarily requires a radical change in the political leadership of the government in the state. This can only come with the LDF victory in the forthcoming 2016 Assembly elections. b) This trajectory of economic development can only be brought about by a more determined effort by all the Indian states to protect the fast eroding fundamental feature of the Indian Constitution, i.e., federalism. The assaults against the states’ rights under this current PM Modi-led BJP Central government, amongst others, is robbing the states of their legitimate share from the country’s finances. Within the overall milieu of the neo-liberal economic policy trajectory, this struggle for ensuring equitable Centre-State relations and the equitable devolution of resources to the states is of crucial importance. Kerala, as a state and a people, was the first victim of the drive for the centralization of power towards imposing a unitary State structure by the Indian ruling classes. Kerala people had then fought against this tendency and continue to fight all along. The time has come now to pick up these threads and carry forward the struggle to protect the Constitutionally guaranteed rights of the states, importantly, on equitable resource allocation. Kerala today is going through a period of painful economic stagnation. Beginning 2011-12 (as detailed in the paper presented for discussion in this Congress), this is happening due to the inability to substantially increase the rate of investment and raise the levels of employment. The present UDF government has displayed a complete lack of any innovation for economic resurgence. It has been completely pre-occupied with increasing the quantum of the “spoils of office” and in internecine squabbles over individual shares from such profits. It’s much tom-tomed perspective plan for 2030 surpasses even the illusory balloons let loose by the 2014 `Modi as PM’ campaign. PM Modi’s balloons have already begun to burst! However, a closer dissection of this growth story in the 21st century shows that this growth came predominantly from the services sector with both agriculture and industry bring at a virtual standstill. Between 1997-98 and 2013-14, agricultural growth was just 0.1 per cent. This was primarily due to a sharp fall in the international prices of what are called “commercial crops”. This was accompanied by the withdrawal of input subsidies, sharp reduction in public investment, rising credit costs and the indiscriminate signing of Free Trade Agreements (FTAs) as a result of the neo-liberal policies followed by the Central government. The consequent alarming rise in farmers’ suicides, unprecedented in Kerala, came to an end only with the 2006 LDF government that revived the vitality of the agricultural sector to some extent. To certain extent, the revival of the industrial sector was brought about by the 2006-2011 LDF government which succeeded in a phenomenal recovery of the public sector undertakings in the state. From a cumulative loss of Rs. 208 crores in 2004-05, the public sector units in the state showed a rise in profits to the tune of registering Rs. 666 crores in 2009-10. The present UDF government has succeeded (!) in registering a cumulative loss of these public sector units to the tune of Rs. 422 crores in 2013-14. A remarkable achievement indeed! Yet another reason to ensure that an LDF government assumes office in 2016. The second disquieting factor was the sharp rise in economic inequalities creating conditions for a potential social unrest. The politically conscious people of Kerala, however, prevented this eventuality. Clearly, for the economic growth story of the 21st century, as shown by the discussion paper, to continue, these two issues must be seriously addressed. I am sure that these issues will be exhaustively discussed at this 4th Congress. The discussion paper highlights five positive factors that can enable the creation of a new development trajectory that combines equity with rapid economic growth: “The first is the availability of substantial potential investment in the form of remittances-led savings in the State. Though Kerala cannot claim to have any large business house, it is bountiful in small capital that could be harnessed to develop small-scale industries, service industries and agriculture. “Secondly, the domestic consumer market in Kerala is one of the largest in India, as evident from the high levels of per capita consumption expenditure. “Thirdly, the nature of human resource development provides Kerala with a comparative advantage in the new growth sectors that are knowledge-based (Information Technology and Biotechnology) and service-based (Tourism). Such a growth pattern is also in conformity with the needs of sustainable development that have emerged after the Paris agreement on climate change. “Fourthly, the State has successfully completed the demographic transition, which makes it easier to universalise the provision of basic needs and eliminate absolute poverty. However, these positive factors in the state are circumscribed by the potential dangers inherent in the sharply growing economic inequalities in the country combined with the overall degenerating atmosphere of communal polarization. The social composition of the Kerala people is sought to be used as a spring board by the communal and the fundamentalist forces to create social unrest that can derail any trajectory of economic resurgence in the state. Kerala people have all along defeated such designs. This has to be done more emphatically in today’s circumstances to ensure the state’s development and people’s growing prosperity. The Constitutionally defined fundamental feature of federalism is getting severely strained under this BJP Central Government today. Apart from various other ramifications that erode the rights of the states, the one particular decision of this Central Government that is of paramount concern for today’s discussion is the decision of this government to abolish the institution of the Planning Commission. At the outset, it must be recognized that the relative autonomy that the state governments had under our Constitutional scheme of things, notwithstanding the continuous attacks at eroding these rights, permitted state governments, like Kerala, to chalk out relatively autonomous developmental strategies, albeit, within limitations. Even that little autonomy is being severely constricted today. Communal agenda – the efforts to metamorphose the secular democratic character of the Indian Republic into the RSS vision of a rabidly intolerant fascistic `Hindu Rashtra’ – requires that the Indian State increasingly becomes a centralized unitary state. In this context, the abolition of the Planning Commission has a direct bearing in restricting further the autonomy of the states, particularly like Kerala, to chalk out an autonomous, however limited, developmental strategy. The Modi government has abolished the Planning Commission and therewith the entire process of national planning. Along with it, this BJP Central government abolished the National Development Council, an apex body consisting of the Prime Minister, the concerned central cabinet ministers, and all state chief ministers together with their concerned cabinet colleagues, which supervised the planning process in the country, gave final approval to the various five-year plans, and met periodically to take stock of issues and policy measures relating to economic development. The Planning Commission was not just an advisory body. It was entrusted with the task of national planning; it discussed state plans with the chief ministers; and it was also a conduit through which resources flowed from the Centre to the states as plan finance. The NDC’s abolition, in short, signifies the end of a forum where states had a chance to express themselves on deeper issues of development policy and strategy. Since the funds that were being transferred to the states via the Planning Commission would now be getting routed through various central ministries, and above all the finance ministry, the replacement of the NDC by the governing council of the Niti Aayog means that the states would have no say on the modalities and principles of such transfers. It amounts to reducing them even further to the status of mendicants, and elevating the central government even further into a potentate that distributes largesse among the states through its various departments and in accordance with its own whims and caprices. The Constitution provides only for the Inter State Council where Central and state governments come together. The Left had always demanded that the Constitutionally-mandated Inter State Council should be the main forum for decision-making on federal issues and meet more often, at least, once a year. In fact, in the initial years after independence, the Planning Commission itself was conceived as the permanent Secretariat of the Inter State Council. Ironically, the Modi government that abolished the Planning Commission shouts from the roof tops claiming to uphold “cooperative federalism”. This is nothing less than fascistic demagogy! The abolition of the NDC has to be seen in the context of a number of other measures being pushed by the Modi government, all of which have the effect of reducing the power of the states. It has taken advantage of the Fourteenth Finance Commission’s recommendation to increase the share of the states in the divisible pool to effect a reduction in the overall transfers to the states. In other words it has so drastically reduced transfers to the states through the non-Finance Commission route, while claiming to implement the Finance Commission’s recommendations and thereby claiming to be sympathetic to the states. The total transfers as a proportion of GDP have gone down in 2015-16 compared to earlier years which were already seeing a declining trend. As Prof. Prabhat Patnaik had noted: (I have relied on his reasoning in this section) the total transfers from the Centre to the states as a proportion of the GDP, which was 6.4 per cent in 2010-11 fell to 6.1 per cent in 2011-12, 5.8 per cent in 2012-23, 5.6 per cent in 2013-14 and 5.4 per cent in 2014-15 (Revised Estimate) against a Budget Estimate of 6.1 per cent for that year. In 2015-16, the budget estimate itself was scaled down to 5.8 per cent. The actuals clearly are likely to be even lower that in any previous year. This BJP Central government appears determined to legislate the Goods and Services Tax, which would take away the state governments’ Constitutionally-guaranteed right to levy those taxes which fall within their jurisdiction at whatever rate they choose, to raise resources to implement their plans in accordance to meet the needs of the people of their states. This, sharply reduces the powers and resource-entitlements of the states. Mercifully, we could stop this from being legislated so far in the Parliament insisting on our amendments. But the Modi government has refused to accept any amendments to protect the rights of the state governments on this score. The abolition of the Planning Commission and the routing of all non-Finance Commission transfers to the states through central ministries is yet another instance of this government’s assault on states’ rights. And now the abolition of the National Development Council where the states could at least voice their protest against the arbitrary decisions of the Centre adds a final touch to this project of centralizing powers and resources. All such measures are an essential element of the neo-liberal strategy. Many were being introduced by the UPA government as well. But the Modi government, with its unquestioned and single-minded loyalty to the corporate-financial oligarchy, which had massively funded BJP’s campaign to come to power, is pursuing this agenda with an unprecedented vigour. This is in addition to the fact that the communal agenda, patronized by this government, requires such centralization to succeed in transforming our country, in accordance with the RSS vision, as discussed earlier. Neo-liberalism requires centralization of power and resources in the hands of a union government that is sympathetic to corporate interests, so that the states, devoid of resources, will then be forced to entice such corporates into their domains, as the only possible means of bringing about any investment and growth. Neo-liberalism wants in short a destruction of any authentic federalism that allows space to states for pursuing divergent strategies, including strategies that do not strictly conform to the demands of the corporate-financial oligarchy. This constitutes the real danger that prevents the Left from pursuing its alternative developmental strategy. The Central issue to advance an alternative strategy is to defeat, politically, such efforts to undermine the federal structure of our Constitution. Kerala, thus, needs a state government that can successfully resist and defeat such assaults on states’ rights, so essential for its autonomous developmental strategies to succeed. That can be none other than an LDF state government led by the CPI(M).